We received an outpouring of requests to implement a Go To Topic feature in v4. Accessed from the Topic Selector, Go To Topic allows you to jump straight to a Topic folder. Select the Topic button to the left of the Topic drop down or Alt-P to open this dialog. In the Topic Search tab, start typing any part of the Topic name and the search window will filter the Topic list using down to the Topic desired or click the Topic Tree tab for an easy way to visualize and assign Topics and Sub Topics. Click the Go to Topic button in this window to open the folder associated with the currently selected Topic. Posted by brad at 11:39 am on December 22nd, 2007. One of the oft-requested features in v3 and earlier was the ability to mark messages as read when they are filed. As you are probably aware, IMS allows the ability to file individual messages, message conversations or entire Topics of messages. IMS v4 automatically marks all of these messages as read when filing. You can change this behavior to leave unread messages be via ClearContext > Options > Preferences > Misc > Filing. See our User guide for more information on Topics and Filing. Posted by brad at 10:31 am on December 21st, 2007. 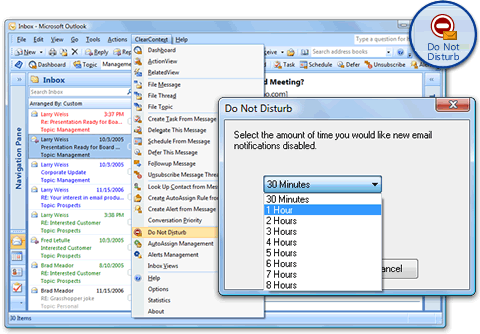 When you are ready to focus on your work for the day, use Do Not Disturb to disable all default Outlook notifications for new messages, including New Mail Desktop Alerts, changes in the mouse cursor, the envelope icon in the system tray and the default new mail sound. To use this feature, select Do Not Disturb from the ClearContext menu. In the Do Not Disturb dialog, select the length of time that you would like to have new mail notifications disabled and click OK. 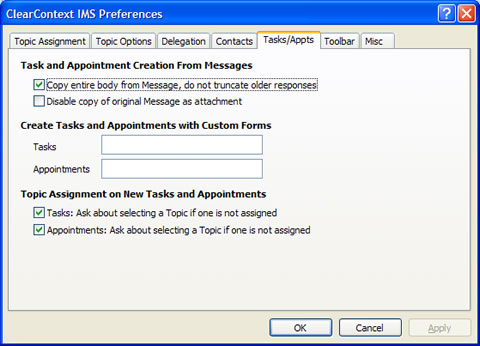 When the time frame specified has past, IMS will re-enable message notifications. If you would like to reset your notifications prior to the expiration time, select Do Not Disturb from the menu again. Do Not Disturb will also reset notifications if you restart Outlook. Alerts will continue to notify you of important email that needs to be responded to, even if it is received during the Do Not Disturb quiet period. Set Alerts on your most important contacts or email conversations if you want to be notified of receipt regardless of Do Not Disturb status. Posted by brad at 7:59 am on December 19th, 2007. The reminder time is the default notification time Outlook uses when creating new tasks. This is also the default time that IMS uses for Defer. I suggest setting this to an hour after you normally start your day, giving you the chance to identify your most important items prior to the alarms going off. Click the Task Options for additional preferences. I personally prefer that "Set reminders on tasks with due dates" is unchecked. I then manually set task reminders for my really important, time sensitive tasks. Posted by brad at 7:43 am on December 18th, 2007. A quick note to registered IMS v3 and earlier users. Purchase an upgrade to v4 before the end of 2007 to take advantage of the introductory upgrade price of $29.95 USD. The regular upgrade price of $44.95 applies starting January 1. Posted by brad at 9:57 am on December 17th, 2007. Download via Microsoft Update, Office Update, or the Microsoft Download Center. IMS v4 is fully compatible with the update. One of the major new features in IMS v4 is Alerts. Create an Alert by message conversation or contact to ensure that you never miss an important reply again. I think of these as personal Service Level Agreements; if you have an important client or are involved in a very important email thread, set an Alert to ensure that you respond in a timely fashion. Contact Alerts are triggered by an email from the same sender. For example, if you select a 2 hour conversation alert, IMS will notify you if you receive a reply to the message and do not read it within the 2 hour grace period. 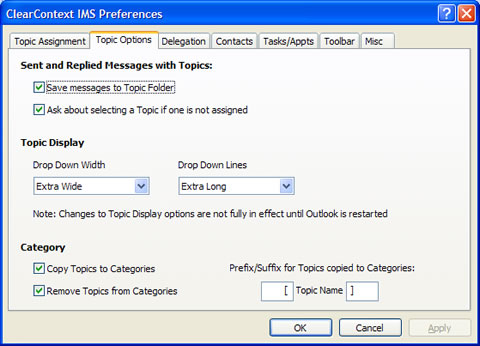 Highlight a message and press the Alert button on one of the IMS toolbars. This will open the Alert create dialog where you can specify the type of Alert you are creating (Conversation or Contact) and the time period. If you receive a message that meets the criterion you set and do not read it within the time frame specified, IMS will notify you via the Alert Management window. Open a contact and press the Alert button on the contact toolbar. As above this gives the option to create a Contact alert. If an Alert already exists for this contact, IMS will cancel it. Double click a notification or press the Open Item button to open a message and read it. The Dismiss Alert button will turn off the alert for the current message. The Cancel Alert button removes the Alert trigger for the current item, ensuring that no further alerts will be issued for this particular thread or contact. Triggers – this tab shows all of the Alert triggers that you have set up. Cancel Alert will remove the currently selected thread or contact alert. Alerts are triggered regardless of the current Do Not Disturb status. To add buttons to the toolbar, highlight the button name in the Available column and click Add. To remove, click items in the Active column and click Remove. Use the arrows below the Active field to change the order of the toolbar buttons. Reset All will put the buttons back in their factory default positions. You will need to restart Outlook for the changes to take effect. Do you miss the second toolbar? Posted by brad at 11:06 am on December 13th, 2007. In the Identify phase of the IMS Daily Workflow, we recommend that you start your day with the Dashboard, reviewing your Tasks and Appointments before moving into Inbox Management. Select OK on this and the Options dialog. Voila! On startup Outlook will open up the Dashboard so that you can size up your day. Posted by brad at 10:43 am on December 12th, 2007.